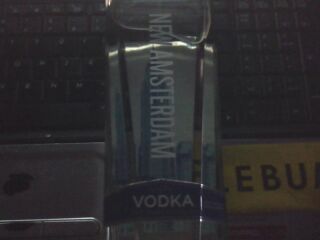 So, a friend of mine who came back from South Korea not too long ago got me a nice 750ML bottle of New Amsterdam Vodka. If you are ballin on a budget, this is definitely something you need to buy. It's one of the mid-range vodkas out there that definitely has a good price point. I believe this bottle was $12.99. It's a really nice, clean vodka. It has a good finish and little burn. Definitely a good choice! I'm about to start sippin a bit with some pineapple juice in a sec! Enjoy your friday night, y'all!